This conference is intended for individuals who hold a current commercial pesticide license. If you do not have a current pesticide license, please visit our New Applicator page. Check In: Check-in will begin at 7:45 a.m. until 9:00 a.m. on Wednesday, January 9, 2019. Start Time: Classes begin promptly at 9:00 a.m. and conclude at 4:00 p.m.
Special note: you'll need to attend the entire day to meet the five hours required for an Ohio commercial license. Parking: A pay parking garage is adjacent to the convent center, $5 prepay, cash only. Click here for information on parking. Conference Only: $100/person - No lunch is available with on-site registration. Registration includes morning and afternoon conference breaks and conference proceedings book. Pre-registration closes at midnight, January 2, 2019. OSU Employees Only: Register with an eRequest. To register with an eRequest, select “OSU Employee” as your Registration Type on the drop down menu. Please list Pesticide Safety Education Program, Ohio State University Extension, as the vendor. On-site registration will be available starting at 7:45 a.m. on January 9, 2019 at the conference site. On-site registration includes morning and afternoon conference breaks and conference proceedings book. There is no lunch available with on-site registration. $10 for pre-registration or on site registration. Option one hour of agricultural fertilizer applicator recertification training. *Does not need category-specific training. Needs one hour of core + a total of four additional hours for a total of five hours. Reciprocity is available for licensed commercial pesticide applicators who hold licenses in other states. At the conference in Dayton, you may receive credit for the states below. To determine the amount of credit for each state, please visit the website or call the individual state's licensing agency. Exams are offered at the conference site by the Ohio Department of Agriculture and are not part of the conference program. All categories exams will be available at the conference site. Do not register for the conference if you are only taking an exam. Click here to register for the exam with the Ohio Department of Agriculture. Exams begin at 10:30 a.m. If you cannot make a location because of plowing snow, sickness, or other circumstance, you have the option to transfer your registration to another 2019 conference for no additional charge. You need to call WalCom Registration Services at 740-524-4123 immediately after missing a conference to transfer your registration. 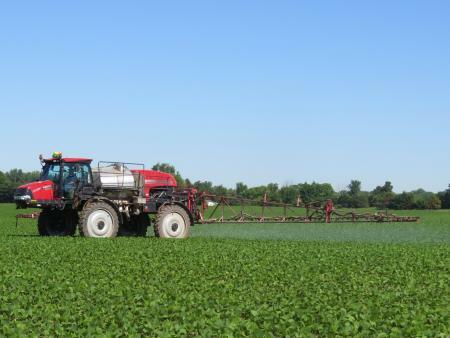 Transferring can only be done between Ohio Commercial Pesticide Applicator Conferences held in Dayton (Jan. 9), Akron (Jan. 15), Sandusky (Feb. 22), or Columbus (Feb. 26). After the Columbus conference you will no longer be able to transfer your registration and could request a refund. There is a $25 processing charge for any refunds. The cancellation fee will be charged per registrant. No refunds will be given after March 31, 2019. There is a $30 fee for returned checks. Please call 614-292-4070 or email pested@osu.edu with any dietary restrictions. For special needs, dietary restrictions, or accommodations for a disability, please call 614-292-4070 at least two weeks prior to the event.